Aerobic Pac- Locking Rack & 43 Pairs Of Neoprene Coated Dumbbells, Available in: 14-1 lb., 12.. Solid Urethane Dumbbells, 12 Sided, Set of 55-75 lb. Solid Urethane Dumbbell Set 55-75 lb. (5 lb. increments) 12 sided Head Urethane Encased Dumbb..
Rubber Encased Dumbbells, 12 Sided, Set of 55-100 lb. 12 Sided Rubber Encased Dumbbells, Set of 55-100 lb. Dumbbells are also available in individu.. Solid Urethane Dumbbells, 12 Sided, Set of 80-100 lb. Solid Urethane Dumbbell Set 80-100 lb. (5 lb. increments) 12 sided Head Urethane Encased Dumb..
Urethane Round Head Dumbbells, Set of 80-100 lb. Urethane Logo T- Clog Dumbbell, Set 80-100 lb. (5 lb. increments) Dumbbells are also availabl.. Solid Urethane Dumbbells, 12 Sided, Set of 105-125 lb. Solid Urethane Dumbbell Set 105-125 lb. (5 lb. increments) 12 sided Head Urethane Encased Dum..
Rubber Pro Fixed Dumbbells, Set of 5-50 lb. Rubber Pro Fixed Dumbbells, Set of 5-50 lb. Dumbbells are also available in individual fixed .. Solid Urethane Dumbbell Set 130-150 lb. (5 lb. increments) 12 sided Head Urethane Encased Dum..
12 Sided Rubber Encased Dumbbells, Set of 5-50 lb. 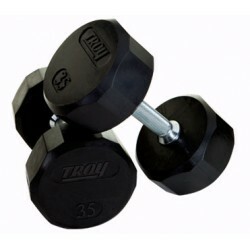 Dumbbells are also available in individual..
Urethane Logo T- Clog Dumbbell, Set 130-150 lb. (5 lb. increments) Dumbbells are also availab.. Solid Urethane Dumbbell Set 5-50 lb. (5 lb. increments) 12 sided Head Urethane Encased Dumbbe.. Solid Urethane Dumbbells, 12 Sided, Set of 55-100 lb. Solid Urethane Dumbbell Set 55-100 lb. (5 lb. increments) 12 sided Head Urethane Encased Dumb..
Urethane Logo T- Clog Dumbbell, Set 5-50 lb. (5 lb. increments) Dumbbells are also available ..